So. Last month it finally came time to read this, and now all I want to do is kick myself for not having read it sooner. Even if it meant that my review would have been crap, and even if it meant that the wait for The Girl Who Fell Beneath Fairyland and Led the Revels There would have been even more cruel. At least I would have lived with this glorious little story in my head for that much longer. This is - this book is a feat of utter nonsense. I hope you take this the way I mean it, because it is SUCH A HUGE COMPLIMENT. I like a good dose of nonsense. But there are very few authors that can really handle it. Sure, some can add dashes of nonsense to liven things up, and some can make you think they are doing nonsense when really it's just dressed-up tomfoolery. But to truly do nonsense well, to make a meal of it and have the reader asking for seconds - that takes real skill. Don't believe me? Go ahead and name some excellent, memorable nonsense. The list is a pretty short one. You've got your Seusses and your Silversteins, your Carrolls and occasionally, when we're feeling inclusive, your Snickets. And now, ruling at their sides as Queen of the Nonsense, you've got Catherynne M. Valente. Long may she reign. Seriously, though. The closest I can compare it to is a modern version of Lewis Carroll, a sort of grown-up nonsense that really isn't nonsense at all. Everything has a little quirk to it; Valente approaches her world slantwise, looking at everything with the fresh, why-the-hell-can't-it-be-this-way perspective that we usually lose far too early in life. Everything's magic. Everything's fanciful. Everything's wondrous. But this does not mean everything is light or fluffy. Much of it is very dark, and very rooted in reality and sorrow, which is what makes the brightness shine so. There's such beautiful contrast, and having that deeper, darker base makes all of the nonsense and silliness seem much more real and true. It's this that makes the book brilliant. Valente has a talent for wrapping up real truths and bittersweet emotions in these strange little gems of fancy. They sometimes burst upon you unexpectedly like a punch to the gut; other times they seep into you so that you half-understand their import before you even realize there's something important there. This is the best kind of nonsense there is. Setting aside my praise of nonsense and bittersweet fairytale-ness, Saturday September (god, I keep doing that...) was a very rootforable character, fierce, loyal, smart and charming. Everything you want in such a book. And it's a judicious telling in that it leaves you wanting more. There is so much going on in the background of things, so many characters and events that you know are bursting with stories, that you find yourself wanting to read those stories, too. You want to know more, to see it and meet them and all of the little things that are hinted at, which is the best feeling when reading. The cast of characters she meets hold their own, with their fun stories and unique histories. 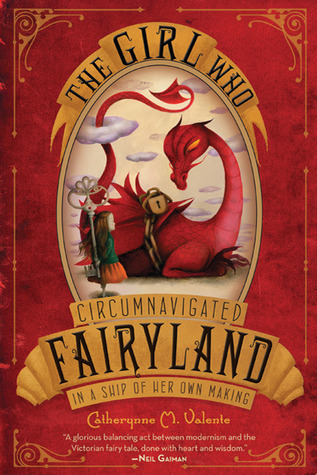 There were so many memorable characters and so many potential side-stories that part of me wishes for and entire Encyclopedia of Fairyland, so that all their stories and histories will be at my fingertips on any given rainy afternoon. The journey September and her friends undergo is entertaining and interesting, and very visual. (I want so badly to witness the Running of the Velocipedes, which is just about the most brilliant piece of nonsense I've ever heard.) It's all odd, most likely crazy, and thoroughly charming. Perhaps best of all, is that it has great cross-over potential across the board. There is really something in the story for everyone, and it works on all levels - a book you can read at different stages in your life and draw something different from it each time. This is the hallmark of a classic, and I have a feeling that like Seuss and Silverstein and Carrol and Baum, Valente's is a name we're going to remember. Very impressive. I actually came to it the other way around -- was already a big fan of the mucisian, SJ Tucker, when she did the song for the trailer, and found out about the book that way! There really is something for everyone in this book. I really enjoyed this one and the short prequel. This is definitely in the vain of Alice in Wonderland. Everything makes sense, but you have no idea why. You had me hooked at "The closest I can compare it to is a modern version of Lewis Carroll, a sort of grown-up nonsense that really isn't nonsense at all." This book seems so interesting! I really like the names she choose (September & Saturday? ), very cool! Oh my word. ANY book that promises such a wealth of fully realized secondary characters that the reviewer demands an accompanying story encyclopedia is the right book for me. YES PLEASE. I keep wasting my time of boring books and not reading books like these. When will I learn. I'm going to have to check it out! Hope I can find it in our small area. If not, gotta love Amazon. the fact that you compare Valente to Carroll is just fantastic because I *adore* his writing! I love some good nonsense myself. it's liberating. The nonsense parts of the book were so much fun! I read this in September and really enjoyed it. Ah! These books sound amazing.